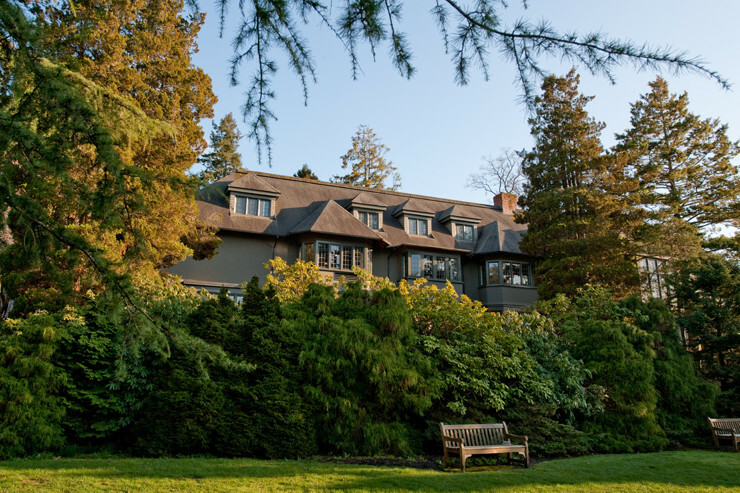 Whether your stay is for a few days or several months, Green College is a scenic short-term guest accommodation option for faculty, researchers or special guests visiting UBC on academic business. It's also an excellent choice for students attending short courses, conferences and workshops. Green College offers a peaceful yet vibrant environment just minutes from the centre of campus. On the edge of Pacific Spirit Regional Park, the College is as close to the beaches and forest trails as it is to a wide variety of campus services and attractions. Those who stay in guest accommodation at Green College also benefit from the amenities of Graham House and the College's beautiful grounds and gardens, and can take advantage of the College's extensive program of free public lectures. One of the College's guest house rooms. 3 Standard Guest House rooms with double beds, private bathrooms and a wireless internet connection. Room amenities include telephone access for local calling, mini-fridge and coffee maker with in-suite coffee and tea selections. 2 Premium Guest House Rooms with queen beds, private bathrooms and a wireless internet connection. Room amenities include telephone access for local calling, mini-fridge and coffee maker with in-suite coffee and tea selections. 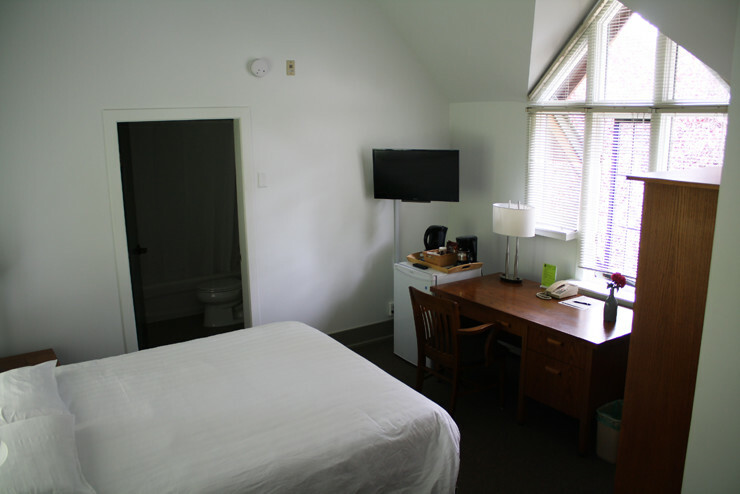 Single and Studio Rooms located inside our residence with just bed, bathroom, and wired internet access (guest must provide their own ethernet cable to connect to the internet). Rooms may have twin, double, or queen-sized beds depending on which is available. Please note that we have a limited number of rooms suitable for persons with mobility disabilities. Much of the property is on steep terrain, with many stairs throughout the facility. Please enquire with our staff about your reservation if you have a disability. Guest stays include complementary meals provided by the Green College Dining Society. Meals are served starting with dinner on Sunday through to breakfast on Friday. No meals are available Friday night through to Sunday breakfast. Breakfast is served in the Great Hall Monday through Friday, 7:30-9:30 a.m.
Dinner is a three-course experience with salad, entree, and dessert and is served in the Great Hall Sunday through Thursday, 6:15-7:30 p.m. The menu changes daily (see the weekly menu), and there is always a vegetarian option. You are also welcome to invite your own guest(s) not staying in guest accommodation to join you for dinner or breakfast. Please note that anyone not already covered by the guest accommodation meal plan requires their own ticket for dinner or breakfast. For those times when meals are not served, there are many food outlets and restaurants on campus (see UBC Food Services) and nearby in the 10th Avenue shopping district and beyond. There are vending machines with snack foods and beverages in the basement of Graham House. The Common Kitchen, used mainly by the College's residents, is equipped with a stove, fridge, dinnerware and small appliances, which can also be used by guests.